Imagine a child in dire need of medical care being turned away from a hospital because of his parents inability to pay. Such cruelty is unimaginable and it happens everyday, but not at St Jude's Children's Research Hospital. They specialize in pediatric catastrophic diseases research and treatment. By doing so they are changing lives and giving hope. They seek to cure and enhance their patients quality of life as well as share knowledge to advance treatment of ill children worldwide. St. Jude's mission is one we can all get behind. 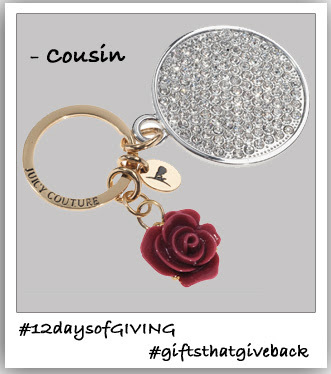 Join St. Jude's efforts by selecting this Juicy Couture Key Fob for your favorite cousin perhaps. The key fob customized for St. Jude's hospital features the organization's endearing logo, a rose and disc charms. Having a sick child is extremely stressful and costly for parents. Help alleviate that stress by purchasing this piece for someone you love. You can also secretly gift one to yourself! We know you want to and it will help put a smile on a child's face. Now what could be a better Christmas present than that?